« Feels Like Spring Is Already Here! Weather continues to be great! We are looking at a chance of rain tomorrow and again Sunday. Otherwise, temperatures remaining in the 50s to low 60s until next week. Monday and Tuesday we return to more normal temperatures for this time of the year….40s. We have see very little or no generation until yesterday. Saturday they ran a low one generator all day, but it was at a level where wade fishing was possible in many area. Yesterday morning they cranked it up to 707 plus then dropped it in the afternoon to the 703 range until later in the day when it went up to almost 705. Today’s projection is for generation all day in a fashion similar to what they did yesterday. Red has been the hot color for several days now. This beautiful 27 inch rainbow was caught by one of our customers, Louie, Sunday just at dusk…you know, it was that “just one more cast” symdrome. Hooked it on a red soft hackle. Good job Louie! Fly fishers have been finding that anything red or with red on it has been catching fish. Red soft hackles (obviously! ), red cracklebacks, tan scuds with red heads and red midges, are a few I have heard. However, don’t forget stripping. Streamer fishing has been great too. Probably at the top of the list has been the olive filoplume, followed closely by the olive CQ streamer. Also, a size 8 olive sculpin pattern. Take advantage of this great weather. Go fishing. I know, I sound like a broken record, but we don’t get this kind of weather in February all the time. 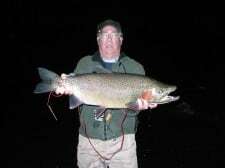 This entry was posted on Wednesday, February 6th, 2013 at 10:50 am	and is filed under Fishing Reports. You can follow any responses to this entry through the RSS 2.0 feed. You can leave a response, or trackback from your own site.